PowerPoint is one of the most popular tools to design presentations. 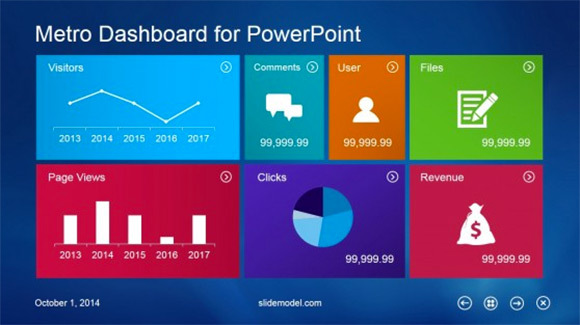 It can be used to make business and sales presentations but PowerPoint can be a great productivity tool if you want to make data dashboard to share with an audience or present online. In Social Media, dashboards can be used to aggregate the most important social media KPIs relevant to an online digital campaign. Here are some of the best PowerPoint templates dashboard that you can download to make dashboard presentations for your Social Media projects. Metro UI gained popularity after the launch of Windows 8. It quickly became very popular as a design trend along with the flat design trend. After Windows 8 was launched, it has caught attention of designers who created lot of HTML, Web Designs and apps for mobile devices using this modern UI. Flat Design is another design trend that caught attention of designers. 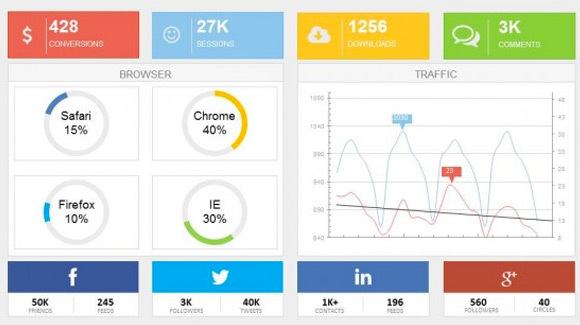 This Flat Social Media Dashboard template can help you to make data dashboard presentations for a Social Media campaign or Digital Marketing campaign. Social Media Dashboard contains multiple dashboard components that you can customize with your own data and prepare a slide with line charts and gauges showing your social media performance. It also contains components where you can add the social media counts for most popular social media networks including Google Plus, Facebook, Twitter and Linkedin. Easily you can edit the components in PowerPoint using shape properties and add additional social networks like Pinterest, Scoop.it, etc. 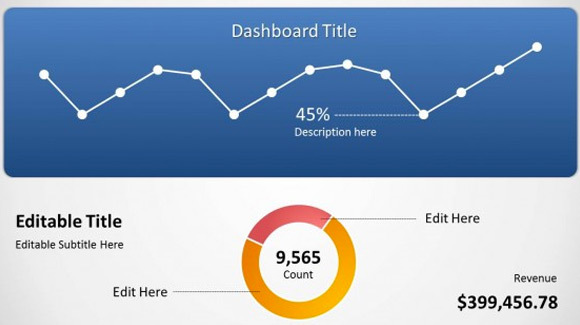 If you want to present only a few indicators then the simple dashboard template for PowerPoint can be helpful. Simple dashboard PowerPoint template contains a line chart design at the top of the slide and space to add a data-driven doughnut chart at the bottom of the slide.